The game begins with players randomly choosing a role and keeping that role secret. And dealing 5 cards to each player—it's pretty much that easy! Resource tokens are used for 1 of 2 things on your turn: either to buy you victory points, or you can cash them in for more cards. It often depends on what your role is. So the players take turns rolling dice, and using them to activate cards out of there hands, which then scores them resource tokens. After players have decided whether to spend or save their resource tokens, the round continues with the next player's turn. One round consists of each player taking a turn, and then victory conditions are checked. If no one has won, then the next round begins; players select new roles, the starting player pawn is passed to the left, and the whole thing starts over. The tricky part is there are sooo many ways to win and/or lose in this game! It all depends on which role you have (which, by the way, changes after every round!!). There's an element of "The Resistance" in this game, which basically means that if someone finds out who you are mid-round, there are plenty of "Town Crier" cards in the deck which players can use to block certain actions, take dice away, and stop you from scoring resources. It's said that because of the printing process there are actually a small percentage of gamers (estimated to be around 3%) who will actually not be able to see the artwork—or at least not in great detail. Jeremiah—Let's put aside the unreal components for a minute. If this game was printed via a standard process, it would be an amazing game. There's enough depth in the mechanics to keep the veteran gamers coming back, but it's light and fun enough to introduce to a new or casual gamer. Firestone—I'm always looking for a game that's going to be a hit with my game group, but that I can also bring out with newbies. Emperor's fills that void. Jeremiah—Let's also not forget the humor side of this! Sabotaging your friends with cards like "Skid Mark" and "Holey Sock" add a decent and light-hearted amount of skullduggery to the mix, without giving too much power to the swindlers! Firestone—I thought the "Bamboozle" card was a little overpowered, but for the most part these were a good mix. I'll never forget the look on my friend's face when I played "The Man Who Was Thursday" on him. Jeremiah—What can I say about the components... When I opened the box it was breathtaking. To get that kind of depth, movement, and clarity on a completely FLAT surface, without the use of glasses or special lights! Totally science-fiction-type stuff; the future is here, folks! Firestone—This gets a big thumbs-up from me, too. Often games with this many mechanisms don't do any of them particularly well, but they've managed to combine everything into a nearly perfect whole. Emperor's New Clothes should be seen to be believed. 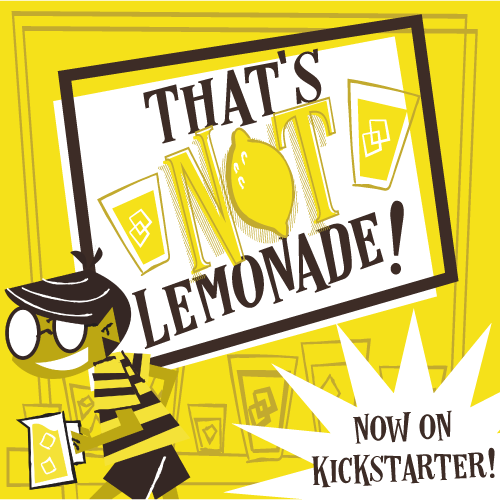 The Kickstarter project ends in just 6 days, so check it out and see what you're missing.